I have a collection of sculptures of women that I keep in my study. 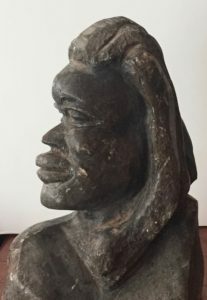 One made of dark stone is a detailed profile of Rose, the wife of an artist that I met in Swaziland. One is of a kneeling pregnant woman with her hands around her stomach, with no face, made of smooth beige stone. My academic work was about women. I have sat with women that were the focus of my research for women with HIV/AIDS. I have stood with women in teaching Women Studies for sixteen years. Prior to returning to graduate school, I taught women dental hygiene students for twenty-two years, some overlapping teaching at two institutions for a total of 38 years. The women I have sat with in particular, have inspired me to write my own story.